omigosh. 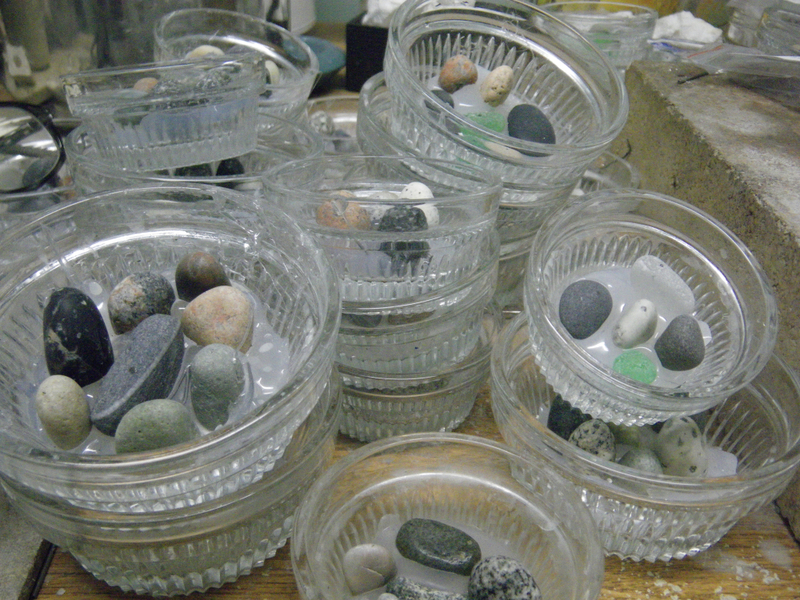 having only drilled a couple of rocks, one at a time, in a pyrex dish, i never imagined that you filled 20-or-so pyrex dishes with LOTS of rocks! i’m FINALLY starting to understand how you can be so productive!!! so impressive! 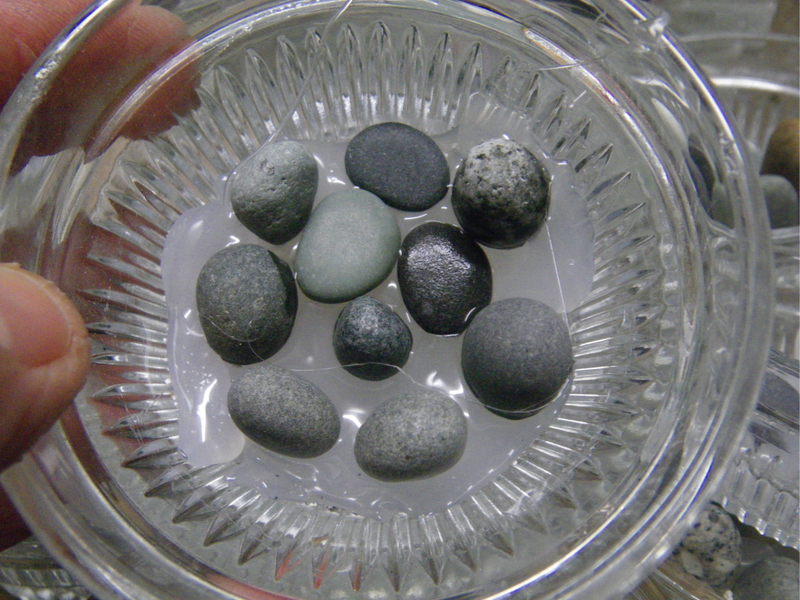 btw, i am loving your daily posts…..
All those little glass dishes for the rocks were such a bargain about 6 years ago. We were in the Fishs Eddy store in NYC (Do you know it? Restaurant over-run of dishes. They used to have bargain prices until everyone discovered it and the store became uber trendy). They had cases of the little and medium dishes for $3. Better yet, there were 33 dishes in a case! I bought one of each size because they were such a good deal. I had no idea what I was going to do with them. If I had been drilling rocks then, I would have bought at least 2 of each and splurged the extra $6. P.S. I’m not sure if I like the post a day challenge, but I think I do…. I love your post a day too. As for productive, I would have to look really hard to find somebody as productive as you are on a daily basis: jewelry, writing, baking, cooking, entertaining, being a great wife and mom, and not to forget the good care you shower on your mother. Chris says I should shut my mind down once in a while, but my mind is in low gear compared to yours. 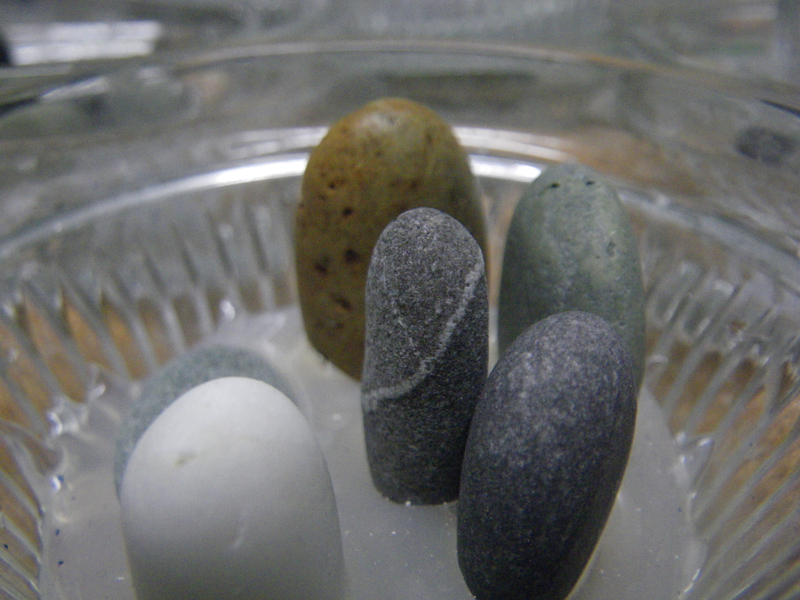 You rock…and drill rocks too! Oh Susan, that is really nice of you. I don’t know why the “productiveness police” occupy my mind so much. Today was a much better day. I took a walk on the beach at low tide, out to the Coast Guard station. It was all flat sand. A real nice break from the icy road we usually use on that same walk. I also took my camera and shot stuff just for the pure fun of it. I’ve forgotten to do that lately. Then home to watch the Patriots game. Yikes! Where were they? What a disappointment! I know. I was happy to be in Orono at the U. Maine vs Boston College. Maine won 4-1. Our seats were so good I actually saw two goals! Peter was especially happy to be there. Actually, I liked the great pep band and the cheering as much as the game! !